This is the first paperback Danish edition of A Thief of Time. It was published in 1989 by KLIM in Århus, Denmark. The text was translated from Tony Hillerman's original English to Danish by Søren Barsøe. The cover was illustrated by Nils-Ole Lund. 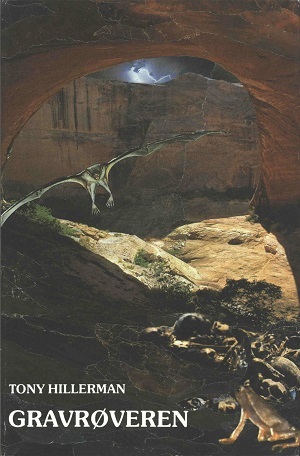 The cover art depicts a bat, a frog, and human remains in a canyon cave. The fold-outs in the front of the book contain a mini-biography of Tony Hillerman and the back cover fold-outs contain advertisements for Tony Hillerman's People of Darkness, The Dark Wind, and The Ghostway. Format: Paperback, 21.5 x 14 cm. Binding: Full-color paper covers with the author, title, and publisher printed in white vertically on the spine.